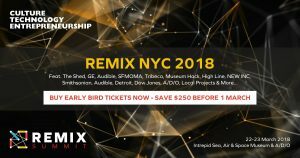 After the inaugural sell-out conference, REMIX returns to New York on March 22-23, 2018 aboard the Intrepid Sea, Air & Space Museum’s aircraft carrier & at A/D/O, BMW Mini’s new design hub. 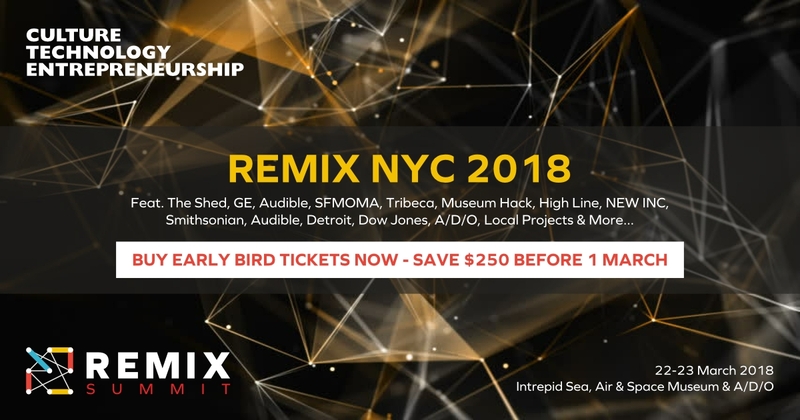 REMIX explores the intersection of culture, tech & entrepreneurship bringing together thought-leaders from many industries to tackle the big ideas shaping the future of culture, creative cities and the creative economy. Attended by hundreds of creative leaders worldwide each year REMIX is made possible by support from our global partners inc. Google & Bloomberg, happening in cities inc. London, New York, Sydney, Melbourne and Dubai. Following our last NYC summit held at Google HQ, MoMA & Bloomberg HQ, we’ve been inundated with requests to do another one. So we’re excited to reveal our line-up for our 2018 NYC summit. Speakers inc.